The hypothesis is the fundamental instrument in conducting research. It proposes new experiments and observations and indeed most of the experiments are undertaken, with the sole aim of testing the hypothesis. It is a propounded explanation for the happening of a particular phenomenon, whose development is based on specific evidence. Due to insufficient knowledge, many misconstrue hypothesis for prediction, which is wrong, as these two are entirely different. Prediction is forecasting of future events, which is sometimes based on evidence or sometimes, on a person’s instinct or gut feeling. 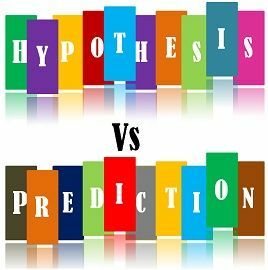 So take a glance at the article presented below, which elaborates the difference between hypothesis and prediction. Meaning Hypothesis implies proposed explanation for an observable event, made on the basis of established facts, as an introduction to further investigation. Prediction refers to a statement, which tells or estimates something, that will occur in future. What is it? A tentative supposition, that is capable of being tested through scientific methods. A declaration made beforehand on what is expected to happen next, in the sequence of events. Based on Facts and evidence. May or may not be based on facts or evidences. Formulation Takes long time. Takes comparatively short time. Describes A phenomenon, which might be a future or past event/occurrence. Future occurrence/event. Relationship States casual correlation between variables. Does not states correlation between variables. In simple terms, hypothesis means a sheer assumption which can be approved or disapproved. For the purpose of research, the hypothesis is defined as a predictive statement, which can be tested and verified using the scientific method. By testing the hypothesis, the researcher can make probability statements on the population parameter. The objective of the hypothesis is to find the solution to a given problem. It should be clear and precise. It should be stated simply. It should be consistent with most known facts. It should be capable of being tested. It must explain, what it claims to explain. A prediction is described as a statement which forecasts a future event, which may or may not be based on knowledge and experience, i.e. it can be a pure guess based on the instinct of a person. It is termed as an informed guess, when the prediction comes out from a person having ample subject knowledge and uses accurate data and logical reasoning, to make it. Regression analysis is one of the statistical technique, which is used for making the prediction. In many multinational corporations, futurists (predictors) are paid a good amount for making prediction relating to the possible events, opportunities, threats or risks. And to do so, the futurists, study all past and current events, to forecast future occurrences. Further, it has a great role to play in statistics also, to draw inferences about a population parameter. A propounded explanation for an observable occurrence, established on the basis of established facts, as an introduction to the further study, is known as the hypothesis. A statement, which tells or estimates something that will occur in future is known as the prediction. The hypothesis is nothing but a tentative supposition which can be tested by scientific methods. On the contrary, the prediction is a sort of declaration made in advance on what is expected to happen next, in the sequence of events. While the hypothesis is an intelligent guess, the prediction is a wild guess. A hypothesis is always supported by facts and evidence. As against this, predictions are based on knowledge and experience of the person making it, but that too not always. Hypothesis always have an explanation or reason, whereas prediction does not have any explanation. Hypothesis formulation takes a long time. Conversely, making predictions about a future happening does not take much time. Hypothesis defines a phenomenon, which may be a future or a past event. Unlike, prediction, which always anticipates about happening or non-happening of a certain event in future. The hypothesis states the relationship between independent variable and the dependent variable. On the other hand, prediction does not state any relationship between variables. To sum up, the prediction is merely a conjecture to discern future, while a hypothesis is a proposition put forward for the explanation. The former, can be made by any person, no matter he/she has knowledge in the particular field. On the flip side, the hypothesis is made by the researcher to discover the answer to a certain question. Further, the hypothesis has to pass to various test, to become a theory.